Fitz: I read good things about the LXmini speakers and I am intrigued by their design, though not their looks. I have some ideas that I like to try out. SL: What do you have in mind? Fitz: I want to use an 8 inch woofer for more bass and a dipolar ribbon tweeter for sweet highs. And the the enclosure should be a box with a vent, like everybody uses. SL: Do you also want to use a passive crossover? Fitz: No. I like the idea of an active crossover/equalizer because the individual power amplifiers then control directly the motion of the voice coil. Also, the tweeter does not see when the woofer amplifier is clipping and generating harmonics that fall into the tweeter's frequency range. SL: Active crossover/equalizers have become easy to design now with the advent of DSP boards that can be programmed/configured graphically, such as the products from miniDSP. But you still need to make acoustic measurements of your mounted drivers in order to equalize for a flat on-axis frequency response. Fitz: I have a measurement microphone and ARTA audio test software, so that is no problem. SL: Hopefully you also have a large reflection free space, like outdoors, so that reflections of the direct sound arrive at the microphone more than 3 ms after the direct sound. Otherwise you measure essentially only the tweeter and its transition to mid frequencies. Fitz: Not really. I only have a balcony, but I know how to make time-gated measurements. SL: Then the measurement microphone needs to be positioned close to the speaker, but at least its largest dimension away. For example, with a 10"x15" rectangular baffle and its 18" diagonal, the microphone should be at least 18'' away from the tweeter. For the reflection to arrive at least 3 ms after the direct sound, and with a speed of sound of 13.5 in/ms (0.34 m/ms), the reflected sound path length must be 3 x 13.5 = 40.5 inch longer than 18". The distance to the nearest reflecting object should be at least 1/2 x 58.5 or roughly 30 inch (0.76 m). Meaningful low frequency measurements can be made with the microphone very close (<1/2 inch) to the woofer dust cap. Fitz: So my measurement data must be interpreted carefully? SL: Yes. Ideally you would have access to a large anechoic chamber, or a large, unobstructed outdoor area with a lift to raise the speaker, and no wind, or a Klippel acoustic field scanner. I measure in my small backyard, have a lift and manual turn-table, sun and often wind to contend with. I have learned to recognize the various reflections from my house, ground, bushes and trees. SL: Decide on the shape of the box you want to use and whether the woofer is mounted on top or on the front. 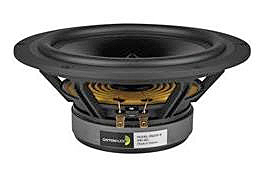 Design for a vented volume that is consistent with the Vas, Qts and Fs of your chosen woofer driver. Build the box, mount the woofer. The dipolar ribbon should probably go on top of the box so that the ribbon can radiate sound freely from front and back. Connect a power amplifier to each driver. Measure separately the raw acoustic frequency response of woofer and of ribbon - on your chosen design axis - using your microphone and ARTA. Fitz: Seems simple enough to do. SL: Now equalize each driver for a flat response using your DSP box for equalization adjustments while measuring the results with ARTA. Equalize for at least two octaves above and below the targeted crossover frequency. Change the gain of the tweeter channel to acoustically match up with the woofer's response. Select corresponding lowpass and highpass filter sections of the crossover in the DSP after you have eyeballed the best crossover frequency from your equalized frequency responses. Drive woofer and ribbon simultaneously with the same test signal from ARTA to see how well their outputs add acoustically in the crossover region. 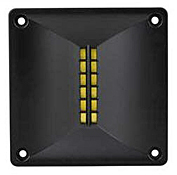 Reverse the tweeter drive signal polarity and observe the notch in response, which should be symmetrical to the crossover frequency and at least 10 dB deep. Maximize the notch and its symmetry by changing the delay between woofer and ribbon in the DSP unit. Now return the tweeter to normal polarity connection and observe overall response flatness. Make or iterate any necessary equalization adjustments until satisfied with the overall on-axis response. SL: Yes and No. You should now have a speaker that is flat on-axis, which in my book is a necessary but hardly sufficient condition for a loudspeaker that is operated in a reflective environment like a domestic room. Fitz: Why is it not sufficient? SL: In a reflective environment you not only hear the direct sound from the speaker, but also the sound that has been radiated from the speaker in all directions, 4 pi around it. That sound also arrives at your ears, from particular directions and delayed relative to the direct sound. Also the speaker excites resonant modes, standing waves in your room, which you notice particularly in the unevenness of bass. And then there is the reverberant field of sound in the room due to a multitude of reflections. Unless you sit very close to your speaker that reverberant field has a higher sound pressure level, SPL, at your ears than the direct sound from your speaker. Fitz: I know that the room has a strong influence upon what I hear. I may have to install bass traps in the corners and/or diffusers/absorbers on the walls to get even sound in all locations. But that may not be an acceptable solution for maintaining domestic peace. What do you suggest to do about the room? SL: The room is not a problem, if it works for your style of living and communicating verbally. The loudspeaker can become a problem by how it illuminates the room with sound and by how the room talks back. It always talks back. Your perceptual apparatus, the brain between the ears, knows how to deal with that. We would not be here if it was not for that marvelous signal processor between the ears. My philosophy is that a loudspeaker has to fit into a normal living space. The loudspeaker is not a piece of furniture, but an artful piece of machinery for the purpose of creating an entertaining - and hopefully highly enjoyable and satisfying - illusion. It deserves a rightful place for that in my living space. 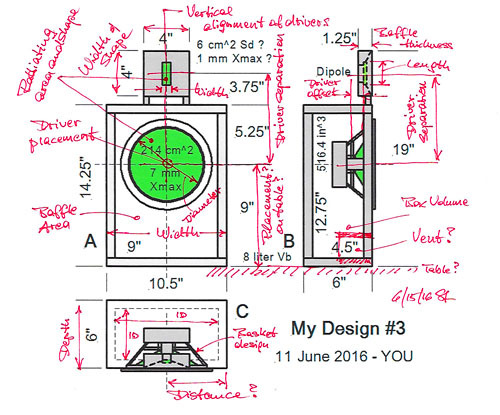 Fitz: What does that have to do with my speaker design? SL: You have not told me about the acoustic design of your speaker. We merely talked about the drivers, the cabinet and the on-axis frequency response. We did not talk about how your speaker will radiate sound in different directions and with what tonality. Our hearing is omni-directional but can be focused directionally. It can suppress what is redundant or irrelevant. It can be distracted by misleading cues. I just pulled from my bookshelf "Acoustics and Psychoacoustics" by David M. Howard and Jamie Angus, Focal Press, 2006. Easy to read and highly recommended. 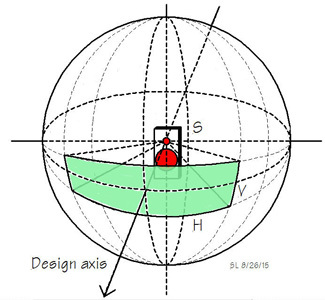 SL: All this means is that a loudspeaker must be designed acoustically for more than a flat on-axis response. It could be designed for a listening window, but then the speaker must be highly directional so that very little sound is radiated into directions where it is not useful, Figure 2. This approach is standard for public address, PA, and sound reinforcement speakers at rock concerts and realized with large line arrays and horns. But in a domestic stereo setup such highly directional speakers tend to sound like headphones at a distance. The auditory phantom scene between left and right speakers appears hard bounded by the two speakers. It is also quite unnatural because phantom instruments and mouths appear magnified in size and detail beyond what is realistic. There are audiophiles who like such rendering of their recordings. I do not. 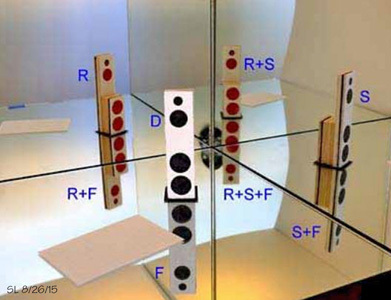 Figure 3 - A loudspeaker talks never alone in a reflective environment. The diffusive, absorptive and reflective properties of surfaces and objects in the room determine how the room talks back to the listener in any particular location. Fitz: So you aim for wide dispersion of sound? SL: Yes, but most importantly I aim for spectrally neutral dispersion of sound. The reflections should have the same timber as the direct sound. If you place a single loudspeaker near a room corner, then the room adds automatically seven more, Figure 3. Those seven should speak with the same voice to me as the real speaker does, even though I see them from different angles. Their individual sound strength, though, may differ from the real speaker. Fitz: That seems like a confusing situation because the sounds from the seven reflection sources will interfere with the direct sound. SL: True, and it depends upon how much later the reflections arrive at the listener's ears than the direct sound. If within less than 3 ms, then they fuse with the direct sound. But if more than 6 ms, then the brain can differentiate them from the direct sound and associate them with the sound of a room corner. There are of course many more reflections in a room than these seven. For example the wall behind the listener reflects sound back to the wall behind the loudspeaker. You have seen this effect when you stand between two mirrors where you see yourself multiple times and receding into the distance. Fitz: A room like a hall of mirrors cannot be acoustically desirable. SL: It would be a reverberation chamber. But nor is an acoustically dead room, like an anechoic chamber, desirable. Hearing has evolved in support of survival. We have the ability to find the direction to a source of sound by moving our head and using the time and intensity differences between the ear signals. We can also segregate streams of sound and focus attention on what is of interest. Those abilities come into play when you listen to loudspeakers in a room. And of course, if the room is too live, then stereo imaging suffers. If the room is too dead then it becomes uncomfortable for socializing, but it is deemed to be a good work environment*** for a mixing/mastering engineer. Listening for pleasure requires a room with some liveliness. It requires reflections with a 60 dB reverberation time in the order of 400 ms to 600 ms. It is of utmost importance that the loudspeakers illuminate the room neutrally. 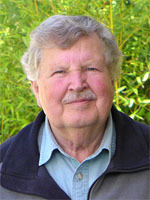 Fitz: So how do you design for acoustic neutrality of a loudspeaker? SL: I will get to that next. It is such an important subject. When I look at today's box loudspeakers I rarely see evidence of sensible acoustic design. 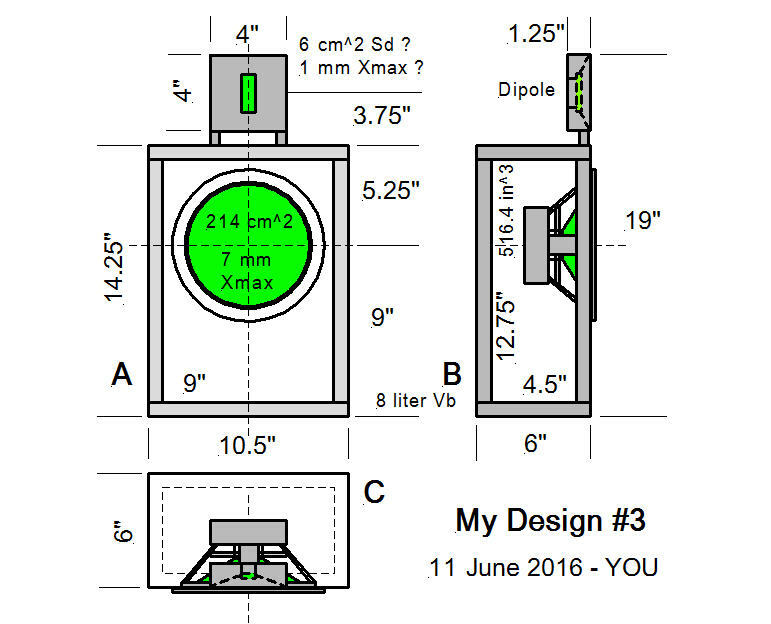 And make me a drawing of your planned loudspeaker, and show its dimensions in mm, so I can explain the acoustic significance of size. Fitz: Already had a drawing. Here it is. 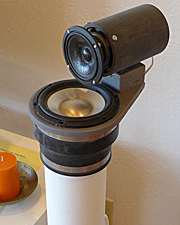 I used inch dimensions because when I work with wood everything is measured in inch and feet locally and I have gotten used to that when it comes to loudspeaker design. SL: That was fast. I will analyze your design for its acoustic and electro-acoustic properties. But first I need to tell you about my acoustic measuring stick. Point source, dependent source, free field, wave guide, cavity, lumped source, distributed source, compliance, mass, damping, reflection, diffraction, scattering, etc.. That will take some time. 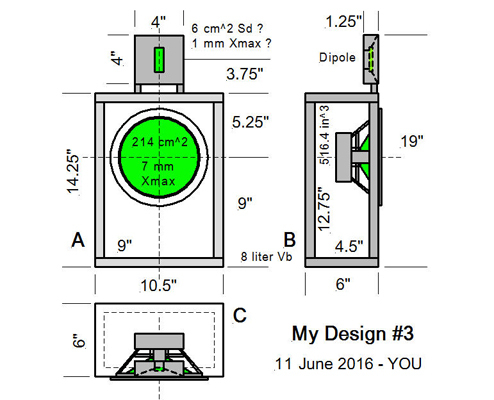 You obviously have some expectations for the performance of Design #3 as compared to the LXmini, but have you considered what might be problematic in your design? SL: I looked at your drawing and marked it up to see for myself which acoustic properties we need to talk about. I see from your drawing that you have made a number of good decisions, but that may not be obvious to some of the readers here. So I need to explain those in addition to where the design could be problematic. I only marked up the acoustic areas of concern. In addition we need to look at the electro-dynamic properties of the drivers to asses their suitability for your loudness and distortion wishes and requirements. Fitz: I see a lot of red ink. SL: Like I said, I have a lot to explain. But I really want to do this because I perceive a major need for better understanding of acoustics. I also want to do this with an absolute minimum of math. I want to convey a more intuitive understanding of acoustic waves, how they are excited, propagate and interact with their environment and with living creatures, like us. Fitz: That seems like a worthwhile project. I would love to learn more myself. SL: OK, Fitz, let's do it.